Despite concerns about Pakistani officials' knowledge of Osama bin Laden's long-term presence in the military city of Abbottabad, it would be rash and reckless to break off aid or relations with Pakistan, witnesses and members of a House subcommittee agreed Tuesday. Rather, the United States needs to find a way to get Pakistan to go back to being the important ally it was following 9/11, when it helped track down and arrest a series of al-Qaida leaders. "Pakistan has provided enormous assistance in the last decade in the fight against al-Qaida, including critical intelligence and military operations," Counterterrorism and Intelligence Subcommittee Chairman Patrick Meehan, R-Penn., said in his opening remarks Tuesday afternoon. "Their efforts should be commended and the United States must continue to foster the U.S.-Pakistani relationship. We must make the relationship work," he added. The hearing was scheduled long before Navy SEALs stormed bin Laden's walled-off estate and shot him dead Sunday. Its original focus was on emerging terror threats from Pakistan, but the reliability of the country's military and civilian government as partners against terror became a natural focus of the session. In an addition to al-Qaida leaders, Pakistan is home to extremist groups such as the Tehrik-e-Taliban (TTP) and Lashkar-e-Tayyiba (LeT), noted Rep. Jackie Speier, D-Calif. Those groups have "embraced the ideological cancer of al-Qaida" and have waged jihadi attacks against U.S. interests in South Asia. Both also have ties to Pakistani intelligence. Fredrick Kagan, resident scholar at the American Enterprise Institute, called the LeT an "incredibly dangerous organization" that U.S. policy analysts have "tended to underestimate." The LeT is not just a "Kashmiri separatist movement" as commonly believed, but an "Islamist movement" with global ambitions. LeT, which was responsible for the 2008 Mumbai terrorist attacks, threatens U.S. interests at home and abroad by acting as a "training provider" to militants from other outfits, said Stephen Tankel, visiting scholar at the Carnegie Endowment for International Peace. He called the LeT a "gateway organization" for aspiring western terrorists seeking access to militant groups in Pakistan. The LeT also helps in the "recruitment and facilitation for terrorist attacks" by other extremist groups. "Bin Laden's death may create space for LeT to play a larger role," Tankel said. But an all-out crackdown on the LeT infrastructure may trigger "a major backlash that could destabilize Pakistan," he cautioned. In addition, an American decision to cut off foreign aid to Pakistan in the wake of the bin Laden killing could prove counterproductive. "In general," Tankel said, "things don't go well for us when we simply decide to treat Pakistan as an enemy." He suggested greater American counterterrorism cooperation with India, Bangladesh, Nepal, Maldives, and Sri Lanka to dismantle LeT infrastructure in "Pakistan's near abroad." The U.S. also should "focus on building up Pakistan's counterterrorism capacity via civilian law enforcement and civilian intelligence agencies." The TTP, meanwhile, is believed to have provided training to attempted Times Square bomber Faisal Shahzad, Kagan said. In an interview Monday, TTP spokesman Ihsanullah Ihsan threatened the United States and Pakistan with retaliatory action for killing bin Laden. "We will attack both the US and Pakistan. But if we could avenge it, Pakistan will be better for us as that is the real traitor," he said. "Whatever wrong was and is being done to Islam and Mujahideen is done by Pakistan. They handed over Mujahideen to US, they sold them to [the] US, and if these reports are true, they also martyred Osama," Ihsan said. The fact that elements within the Pakistani establishment also had ties to the Haqqani network and the LeT was "unacceptable to the U.S.," said Rand Corp. political scientist Seth G. Jones. The Haqqani network, a terrorist group tied to the Taliban that operates out of the North Waziristan, the lawless belt between Pakistan and Afghanistan, has led several attacks against U.S.-led NATO forces in Afghanistan. Jones called on the United States and Pakistan to act quickly to counter the terrorist threat from the area. "Based on threats emanating from the region we do not have much time," he said. There is "no simple solution to the problems we face in Pakistan," Kagan said. The country has the "densest concentration of the most dangerous Islamist organizations" that have been "allowed to run freely." Committee members repeatedly pointed to the bin Laden raid as evidence Pakistan is not living up to its commitments to the United States. Homeland Security Committee Chairman Peter King, R-N.Y., noted how close bin Laden's compound was to a military academy and the headquarters for the Pakistani intelligence services. "There are two possibilities and one answer," about Pakistan's knowledge, King said. "One is that it was a direct facilitation by elements of the Pakistani government, or Pakistani intelligence is totally inept, and that has not proven to be the case over the years." 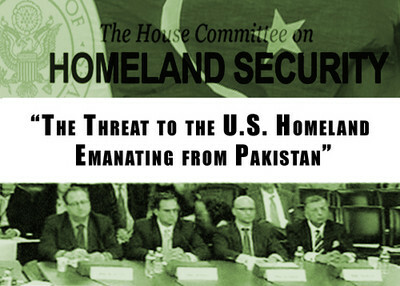 Speier questioned U.S. assistance to Pakistan. "With all the money we have spent we have not gotten the trust from the Pakistan government," she said. Despite billions of dollars given in aid to Pakistan, Osama bin Laden lived undetected in the garrison city of Abbottabad for six years. But, like Tankel, Kagan said the United States cannot afford to close the door on Pakistan. "We stand at a very important precipice in American policy right now … It is essential to communicate our frustration with Pakistan but that we are not leaving, whatever leaving means." The country has used terrorist groups like LeT to wage proxy wars in Afghanistan and against rival India. That strategy is backfiring on Pakistan's security interests, Kagan said. Pakistan's rulers need to see that and come to a consensus that "all militant Islamists pose a threat to Pakistan's survival." By the same token, U.S. officials should not view bin Laden's death as an opportunity to strike a deal with the Afghan Taliban and start a rapid drawdown of U.S. forces there. "One negotiates best in a moment of strength and we have not reached that," he said. Also, the Taliban continues to be pose a robust challenge and "has not reached a moment of weakness." Shuja Nawaz, director of the South Asia Center at the Atlantic Council of the United States, urged America to focus on economic development in Pakistan, where a third of its 180 million residents are young and poorly educated, as a way to minimize the appeal of terrorist groups. In addition, the United States should continue to try to help ease tensions between India and Pakistan. "A stable and secure Pakistan can help create a stable South Asia and a safer United States," and more robust trade and economic ties between the nuclear-armed neighbors could help "reduce the need for unproductive military spending," Nawaz said. To read the written testimonies of witnesses, click here. The PBS program "Frontline" examines Pakistani support for insurgents and terrorists in a new episode that can be seen here.